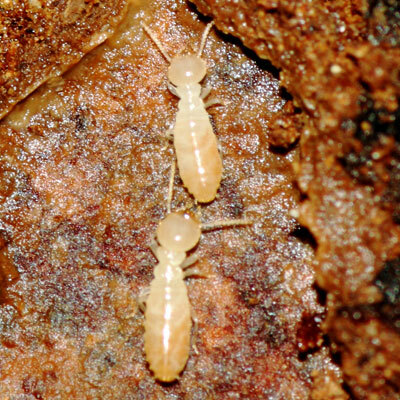 Subterranean termite colonies produce winged swarmers, or more accurately, alates, whose sole function within the colony is to match up together, male and female, after exiting the colony and find a new nest site in which to begin a new colony. 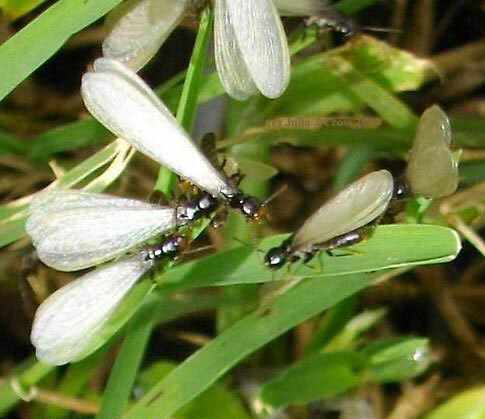 These winged swarmers don't pose a threat to the homeowner but they do indicate the presence of a colony either within the home or somewhere nearby. As a rule of thumb, if they appear outside the house, as on window sills or doors, they probably came from somewhere else nearby and only collected there since they're not strong fliers and wind conditions often dictate where they end up. 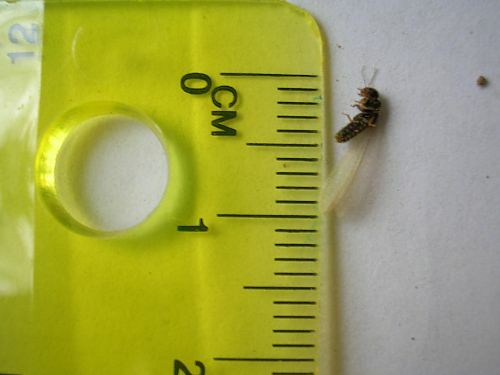 However, if they swarm within your home, then the house almost always has a termite problem and this annual mating ritual may be your first indication that they've been working on your home a while. In the first pic below, a couple of workers appear next to a swarmer. They're the same length but different colors. The workers (white or creme-colored) are the ones that are doing all the damage. The two pics below reveal how small they really are. 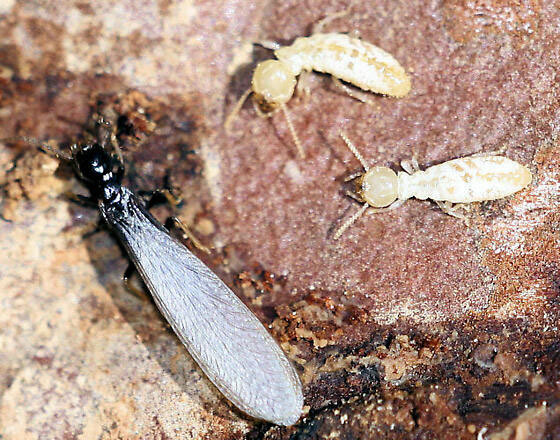 The pic on right shows the swarmer that has already dropped its wings after flight. 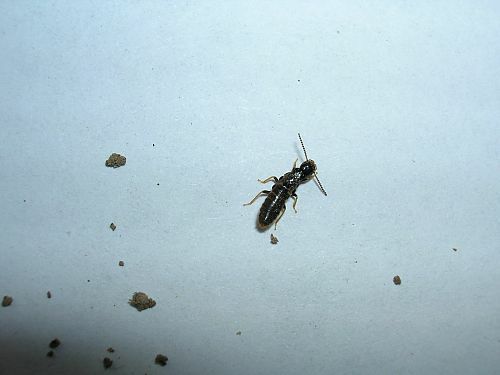 Differences between Termite Swarmers and Ant Swarmers? Look below to see the clues. 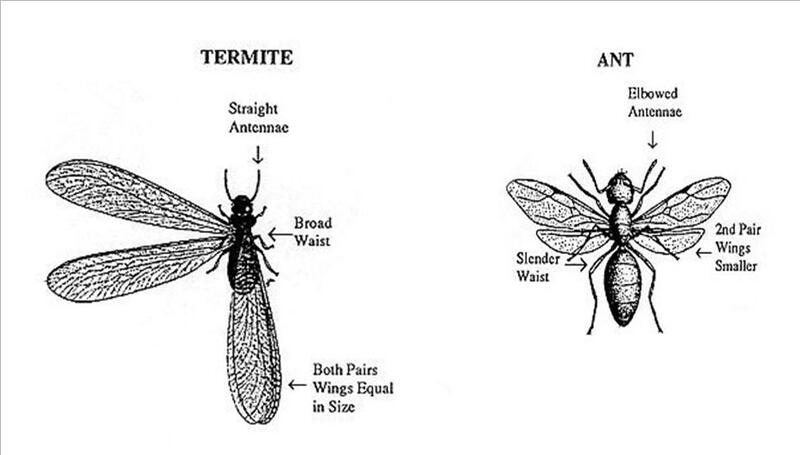 And yes, ants have swarmers too so it's important to know the subtle differences. Below you can see how termites have chewed through the drywall. They are eating the paper off of the gypsum but chew too far, exposing a hole in the wall, which they must seal up with mud. They don't always seem to know at first if the hole is going to lead somewhere so sometimes they tend to overwork it and the whole thing ends up looking like a government bureaucracy gone wild. 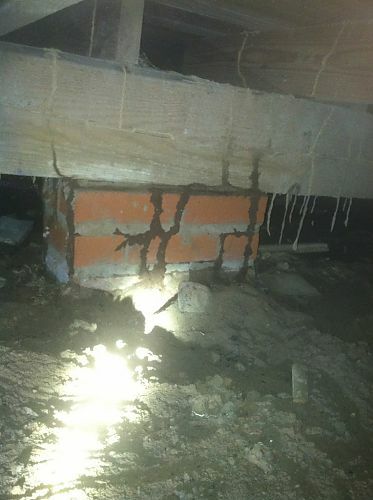 Below is a pic of a pier & beam house that has termite tubes accessing the house subflooring vie the pier and the beam. This particular home had been broadcast-sprayed by another company using traditional repellant termiticides, and as you can guess, they didn't do a very good job. The beam above the pier is so infested that the termites have even built mud stalactites reaching down from the beam and almost reaching the soil.